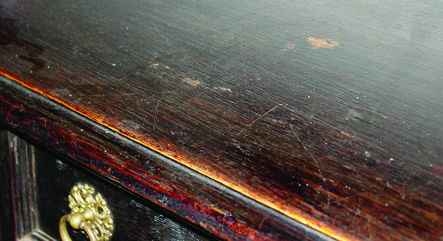 The staining of wood to black to resemble ebony, a common decorative technique used in Renaissance Revival and Louis XIV furniture. moldings, and paneling. Oftentimes, ebonized furniture is found in a room with very rococo plasterwork, or with gilded ceiling medallions, door moldings, and china. 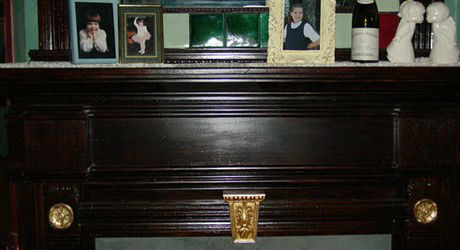 Ebonized wood moldings, surrounded by gilded trim, is a home accent commonly associated with Eastlake style furnishings. 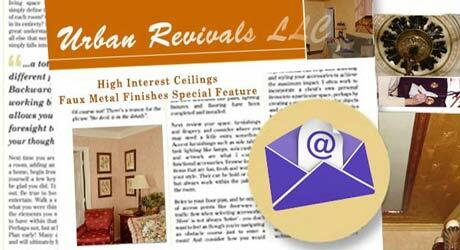 Urban Revivals uses several techniques, some applied on the bare wood (for the darkest blacks), and others which use a black suspension in lacquer. Techniques includes using india ink, leather dyes, aniline dyes, chemical compounds, or tannic acid (vinegar) solutions that have reacted with metal and are subsequently neutralized with an ammonia solution. This table and matching sideboard were a lot of work to strip. 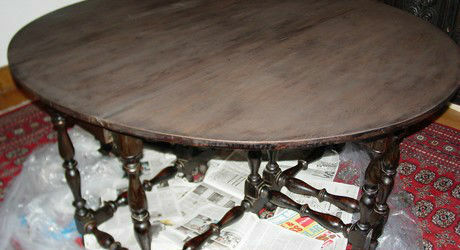 The old varnish was highly worn and scratched. These pieces were not of high value and there was no historic significance to them. We can ebonize any hardwood. We thoroughly remove all previous lacquers or varnishes to create a flawless finish. We can create all colors, from midnight blacks to deep brown-blacks and darkest burgundies. 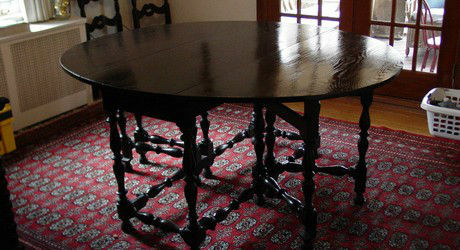 Our finishing techniques most commonly employ French polishes or Danish oil treatments, but we can support lacquer, varnish, wax, and even polyurethane finishes, if requested. This table cleaned up beautifully. We were fortunate that there were no deep gouges, just plenty of scratches. There was considerable lack of uniformity in the wood after removal of the old varnish, but we were able to transform the table to a deep black overall. This mantel was built by Urban Revivals, from salvaged wood. We also gilded a keystone, in composite leaf over red bole, and incorporated it into the design. The finish is an ebonized one, where the black is largely carried in the many finish coats. A choice was made to allow a bit of the burgundy in the original wood to shine through. Here is an interim step in this fireplace mantel. 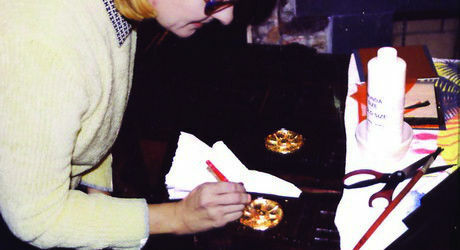 We are applying the gilded rosettes prior to building the mantel in place.